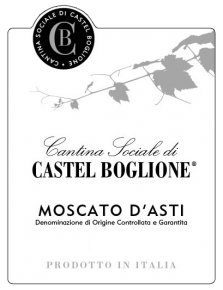 Moscato d’Asti is a semi-sweet, lightly sparkling (the Italian term is frizzante), low-alcohol wine made with Moscato grapes grown in vineyards near the town of Asti. Moscato has grown incredibly in popularity in the last few years. Characterized by elegant floral aromas and notes of peach, apricot and fresh grape juice. Moscato needs to be served well chilled and it is delicious with apple desserts, fresh berries, peach cobbler and hazelnut cakes. Because of the balance of sweetness and acidity and the low alcohol, Moscato is the ideal aperitif or brunch-time companion. Enjoy! Grapes are harvested by hand during the month of September. Fermentation takes place in pressurized tanks at controlled temperature with added yeasts. The alcoholic fermentation is interrupted by lowering the temperature, thus killing the yeasts and late filtered to remove them. The resulting sparkle is subtle (maximum total pressure is 1.7 bars) and the wine retains the natural sweetness of the grapes.